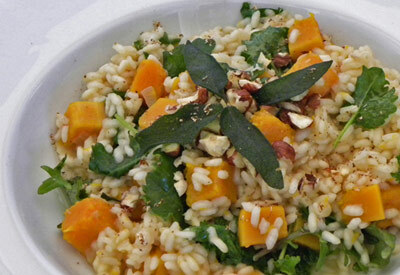 Sweet butternut squash is the foundation of this delicious risotto. Supported by rich baby kale and crunchy toasted hazelnuts, then garnished with crispy fried sage leaves, it's a healthy, earthy dish. This creamy, flavorful risotto serves beautifully as a main course for vegetarians; it also makes a lovely accompaniment for roast turkey or a standing rib roast. Melt 4 tablespoons of the butter in a large skillet over medium heat. Add the onions and cook, stirring occasionally, until they soften, about 5 minutes. Add the butternut and cook, stirring frequently, for 5 minutes. Pour in the wine and cook until the liquid evaporates. Add the rice to the skillet and cook, stirring frequently, until the rice is hot, about 2 minutes. Add 1 cup of hot stock and the salt to the rice; cook, stirring constantly, until the liquid is absorbed. Add another cup of stock and cook until it is absorbed, repeating this step until the rice is still firm but tender (about 20 minutes total). Add another 1/2 cup of stock to the skillet along with the baby kale. Cook, stirring frequently, until the kale wilts, 1 to 2 minutes. Stir in the remaining 2 tablespoons of butter and season the risotto with salt and pepper to taste. If the risotto is very thick, add more stock; it's meant to be loose and creamy. While the risotto is cooking, pour oil into a small saucepan to a depth of 3/4 inch. Heat the oil to 375 degrees F. Fry the sage leaves (do this in batches so you don't crowd the leaves) until crisp, about 10 seconds. Transfer the sage to several layers of paper towels to drain. To serve, divide the risotto among 6 shallow bowls. Garnish each serving with a sprinkling of hazelnuts and a few of the fried sage leaves. Serve with Parmesan on the side, if you like. Save $2.00 on FIVE (5) Purina® Beyond® Wet Cat Food cans, any variety (3 oz. ).